From the earliest times, there has been a need for soldiers to be identifiable, not only to distinguish friend from foe, but regiment from regiment on the same side, in order to make possible effective tactics and manoeuvre amid the noise and smoke of battle. Thus came distinctive uniforms, regimental Colours, and badges. The principal place for regimental badges has always been on the soldiers' head-dress, but badges have been (and still are) often worn on collars and sometimes on other parts of the uniform. 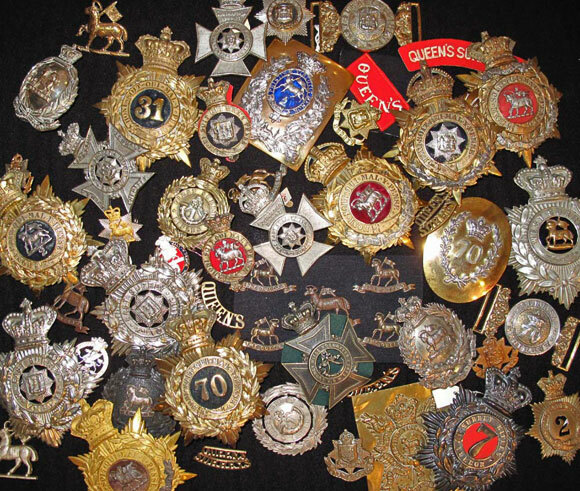 The style of regimental badges was a successor to those of mediaeval chivalry, with the badges containing symbolic references to people, places or events associated with the regiment concerned. From the early eighteenth century until 1881, infantry regiments of the line were known by their regimental number, and the number formed part (often a large part) of the regimental badge. In 1881, line regiments were given county designations and these numbers disappeared from badges. 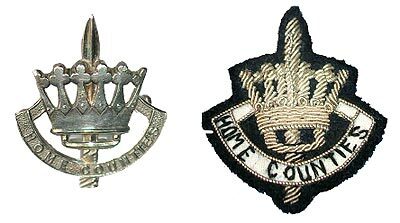 In their place, most badges included a pictorial reference to the regiment's associated county, often part of the coat of arms of the county concerned or one of its principal towns – thus the badge of the East Surrey Regiment included part of the arms of the town of Guildford. 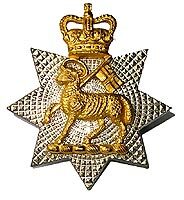 There were, however, some notable exceptions to this generalisation; The Queen's Royal Regiment, which retained its famous Paschal Lamb in the Regimental badge, being one such. From early in the 20th century, soldiers' battlefield uniforms became progressively less distinctive, as weapons and tactics changed and the need for camouflage increased, and shiny badges no longer feature on field dress (although the Geneva Convention continues to require soldiers to be identifiable on the battlefield, so the original principle still holds good). On Barrack, Walking-out and Ceremonial uniforms, however, regimental badges continue to be worn with pride, and continue to distinguish regiment from regiment as they always have. The text for the badges of The Queen’s Royal Regiment and East Surrey Regiment were compiled and written by Philip Haythornthwaite, and published in Medal News. The Association is most grateful to the editor of Medal News and Philip Haythornthwaite for permission to use and print the articles on our website. The majority of the badges are the property of the museum but other collections have also been consulted. Thanks are also due to Alan Caulkett and Ian Chatfield for their assistance.